I had the chance to spend a day on a Greek island this summer. While a day might sound short, it was ample time to fall in love with the beauty of the place and also to have one of the best meals of my life at a fish restaurant by the water. We ordered no less than ten or twelve dishes for the table and I was amazed by every single one of them. From the crispy, paper-thin slices of fried eggplant and the tender char-grilled octopus to the tiny shrimp and feta casserole and the crusty bread dipped in fragrant olive oil and oregano, each dish was simple but expertly prepared to showcase the freshness and quality of the ingredients. Since my return from that trip, I've managed to pester my Greek friends to cook for me and realized that Greeks and I are very much alike in at least one thing: We are ridiculously passionate about food and happy to spend hours discussing it! I am armed with tons of notes from these discussions and meals, so look for some more Greek recipes here soon. 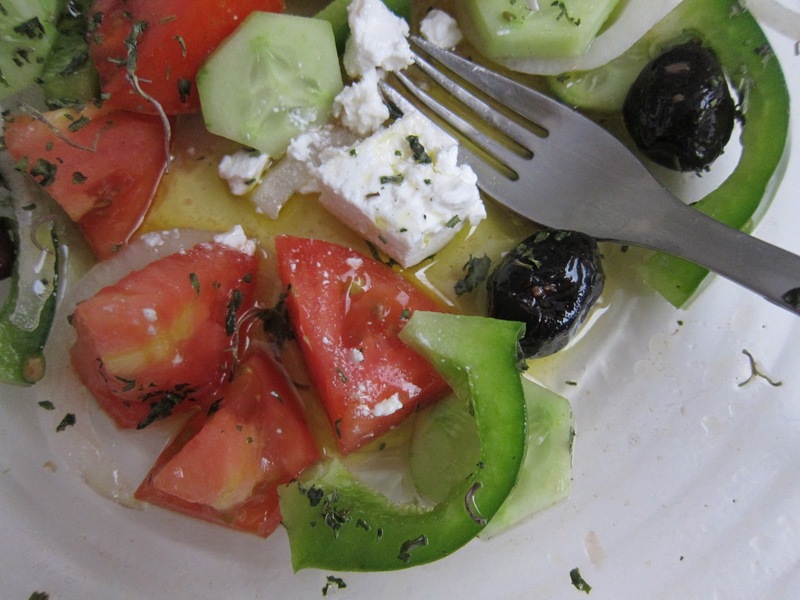 One of the dishes that stood out the most during that meal was the Greek salad. It was a delicious marriage of sun-warmed vegetables with salty, creamy feta and the dried oregano in it blew me away with its strong aroma. Here in the US, we are so used to the stale jarred dried herbs from the supermarket that a taste of the real thing was a revelation and a powerful reminder at the same time. I ate the whole salad, sopped up every last drop of the dressing, and barely kept myself from licking the bowl. I reverse-engineered this recipe from the salad I had in Greece and Wikipedia confirms that I have the correct ingredients, so I am certain that this is an authentic version. The keys to this salad are to get the best quality ingredients. Try to find smaller cucumbers rather than the arm-length, woody grocery store ones. Most important of all, make sure your dried oregano is not stale. Its flavor absolutely makes the salad. The oregano in your supermarket's spice section has probably been sitting there in its plastic jar for months if not years and will have lost most of its potency. I use oregano which my mom and aunt pick and dry when they go to Turkey's west coast, where the air is always fragrant with herbs growing wild on the earth. Failing a Mediterranean source, buy your oregano from specialty spice shops with high turnover and ask to smell a sample before purchasing. You can also dry a big bunch of fresh oregano yourself in the oven. Here's how. I don't season the salad with salt. Instead, I just make sure that each bite of vegetable is accompanied by a bite of olive or feta cheese. Don't use pitted olives. Leave the cheese in one piece on the top instead of crumbling it into the salad. Serve with crusty bread to soak up the dressing. Serves 2-3 as a side dish. 1. Toss the first six ingredients with the vinegar in a shallow bowl or soup plate. 2. Lay the feta over the top and drizzle the whole thing with the olive oil. Thanks for the recipe! I just tried a Greek vinaigrette recipe that wasn't very good. It had many more ingredients than your recipe. I guess simple is the way to go!